I'm heading out of town for a fun weekend with my daughter and godchild (who is now a college freshman!) We're going to a Rockford, Illinois, which is only an hour from home, but I've wanted to explore the city's many museums for years. In a way, it will also be a mini pilgrimage because I hope to visit several beautiful Catholic sites while we are there. I plan St. Mary's Grotto, a replica of the one where the Virgin Mary appeared to Bernadette Soubirous in 1858 in Lourdes, France. I also hope to take in a Latin Mass (my daughter and godchild's first Latin Mass) at the Saint Mary Oratory. Finally, we're hoping to check out the St. Joseph's table and go to Mass at the beautiful St. Anthony of Padua Church. I'll try to take some photos to share with my blog readers next week. 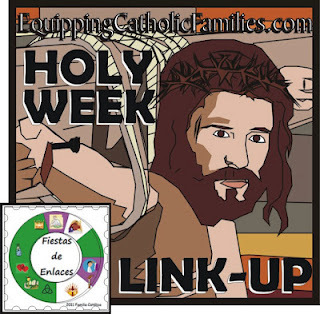 I'm participating in Equipping Catholic Families' Holy Week Fiestas de Enlaces Linkup, sharing ideas on how to make Holy Week more meaningful for your family. Check out all the great ideas here! I knew we had CGS and homeschooling in common, but I didn't realize we share the same state. I will have to check out these pilgrimage sites! We love Anderson Gardens in Rockford!